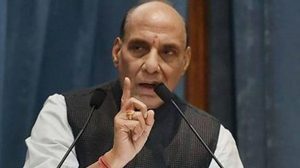 New Delhi, Feb. 11 (IANS): Home Minister Rajnath Singh on Monday cancelled his meeting with chief ministers of the north-eastern states to discuss the controversial Citizenship (Amendment) Bill, which is likely to be presented in the Rajya Sabha on Tuesday. The sudden cancellation of the meeting assumes significance in the wake of the ongoing widespread protests against the Bill in the north-eastern states. Prime Minister Narendra Modi had promised to the people of the north-eastern states that the Bill will in no way cause harm to their interests.